Do you have a minute to spare to learn some English? Then join Sam, who has a quick and simple lesson about five different ways that you can use the word hard. Give us 60 seconds and we'll give you the English! Hello, everyone. 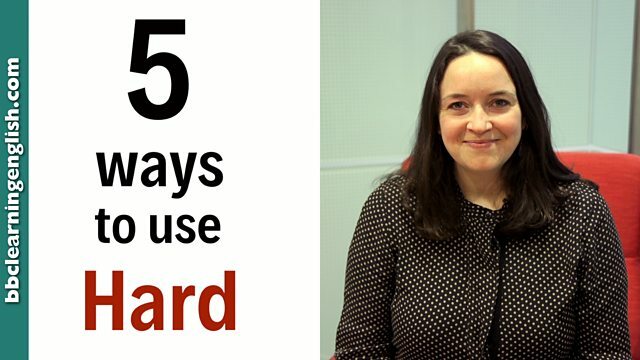 I'm Sam from BBC Learning English and today we are looking at five ways to use the word hard. As an adjective describing a thing, it can mean the opposite of soft. For example: Wood is hard. The opposite of easy. For example: The exam was hard. And it can mean something that involves effort: Running a marathon is hard. As an adverb describing an action, it can mean to do something with energy, such as: She works hard. Or to use force. For example: He hit the ball hard. Just be careful not to confuse it with hardly because that has a different meaning. So not too hard, is it? Hard is not the same as hardly! Are we talking about the opposite of soft or the opposite of easy? 'Maths is harder than biology.' What does hard mean here? If the word hard describes the noun work, it's an adjective. If the word hard describes the verb work, that means it's an adverb. In which of these sentences is 'hard' an adverb? Does hardly mean the same as hard?